Spock: Admiral, if we go "by the book", like Lieutenant Saavik, hours could seem like days. The most successful Lotus 30 or 40 ever raced. This web site is devoted to preserving the history of the Pink Stamps Lotus as well as other vintage Lotus 30s and 40s sports cars. They were the largest sports racing cars that Lotus ever built. They were as fast or faster than the Formula One Grand Prix cars of its time. The car known as the Pink Stamps Lotus 30 was the most successful of these cars. It competed in over 50 International Grand Prix Races for Sports Cars and National (Great Britain) Races. It has a total of 21 wins, 10 second places, 6 third places and one each at 4th, 5th, and 6th place. It also achieved 13 overall wins, 10 second places, 5 thirds, and 8 fastest lap of race records. The Pink Stamps Lotus 30 is owned by Richard Keyes of Portland, OR, USA. It has been restored to near the condition it was when raced at Silverstone on 30 Aug. 1970, where it set the fastest lap and won its first race as the Pink Stamps car. It is powered by an ex-Alan Mann Ford GT 40 LeMans engine with Gurney-Weslake heads. 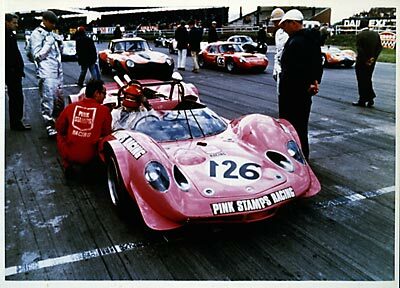 This web site has numerous photos of the Pink Stamps Lotus. You can also find information about several other Lotus 30s and 40s. Included are profiles about some of the drivers and teams that raced these fabulous cars. Visit our Vehicle Chassis Registry for the Lotus 30 and 40 on this site. If you know of any information regarding these cars, please send us an email.